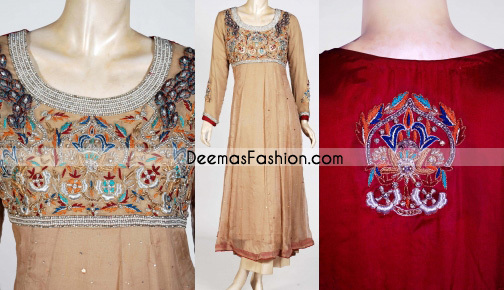 Tags: Beige, Bright Red, Frock, Full Sleeves, Straight Trouser, Thread Embroidery. Beige and red crinkle chiffon anarkali top has abundantly embellished bodice and motif on back side.round neckline. Fully lined. Concealed back zip closure. Piping edges finished. Off white raw silk straight trousers. Concealed front zip fastening.